I'm extremely pleased to announce that I got to write the introduction for a new edition of two books by the godmother of noir Elisabeth Sanxay Holding. 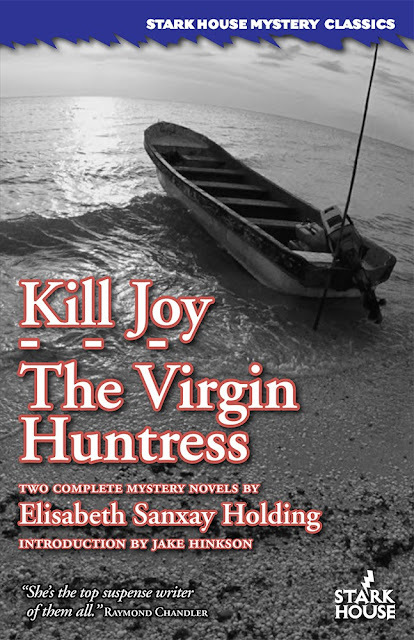 Coming out on June 24th, the volume collects KILL JOY and THE VIRGIN HUNTRESS two excellent, if lesser known, Holding novels. For newcomers to Holding's work the book will be a nice intro to the two spheres--domestic noir and psycho noir--that she helped to shape in the forties and fifties. For readers who are already fans of her better known books like THE BLANK WALL and THE INNOCENT MRS. DUFF it will be a welcome reminder of what makes her one of the greatest of all crime writers. Well, Jake, I trust your word more than many and went and got a Duff/Blank Wall twofer...started reading last night and am nicely blown away. Thanks for the info and advice! And also The Blind Alley, which will lead to more purchases, no doubt. Oh, and you're the man! A true noir soldier. ps You know if Saint Homicide will ever pop up in print here in the states? Ebooks are fine, but it would look good in my noir book collection. I'm so sorry I haven't responded to this by now. I need to check my Blogger settings, I think, because I didn't get a notification of your post. At any rate, thanks for the kind words. I'm glad you dug the Holding. It's really good stuff. As for Brewer, I think 13 French Street is your next best bet. That's the quintessential Brewer, I think. It's all good Jake, I'm a patient man, having come from a time when one had to send a letter to someone and hope for a response in a year or two, or never. I have actively avoided the "big" novels by Brewer, knowing that when I got around to them it would be like saving the best part of a piece of cake, over and over! So 13 French Street it is. Loved The Blind Alley by the way. Am currently watching "A Woman on the Run" and falling slightly in love with Ann Sheridan. I must confess, I'm ignorant in many of the ways of film noir and your book has shown me multiple paths to follow.